Even back in the early part of his career, Brad Pitt owned any screen he was on. In 1993 he is a fairly unknown actor, having been in Thelma and Louise, Cool World and a River Runs Through It but nothing you could call star-making. Kalifornia wouldn’t be the movie that would make him a star either but from the moment he is on-screen, you can’t help see his potential and future success. Pitt plays a dark, mysterious and constantly terrifying character called Early Grace. His past is mostly unknown and all you mainly get from the character is a long stare, a dirty smile and the classic “crazy Pitt Southern drawl” that he has perfected throughout his career. Pitt is partnered with an also excellent Juliette Lewis, who plays the less than intelligent Adele, who is besotted with Early and can’t see his darker, controlling and terrifying side. Neither it seems, can David Duchovny. Just starting his early career as an FBI agent, Kalifornia is a rare movie appearance and he is arguably the lead of the movie, forcing the story forward with his obsessive desire to visit and document the sites of famous serial killings. This is the first issue that the movie faces. Duchovny is excellent as Fox Mulder and has made that role his own. He is also very accomplished in Californication but when alongside actors like Pitt and even Lewis, he fails to spark and charm like his FBI character does. It doesn’t help that you are stuck trying to believe that Duchovny’s character hasn’t noticed the serial killer in his car. There are infuriating times when you are forced to suspend your disbelief slightly too far, especially when Pitt persuades Duchovny that a bathroom hiding a dead-body has no sink. It makes for strange watching and doesn’t quite gel. The movie works best when the secret is finally exposed. When Pitt can go full crazed, serial killer, the movie becomes an effective thriller. Michelle Forbes’ character sees through Pitt’s and when her fears come to fruition, the movie changes, playing to Pitt’s early strengths. From that moment Kalifornia is more like a classic cat-and-mouse chase film, with some dark twists and very bloody endings for key characters. It is never less than engaging by this point and the early missteps are easily forgotten. 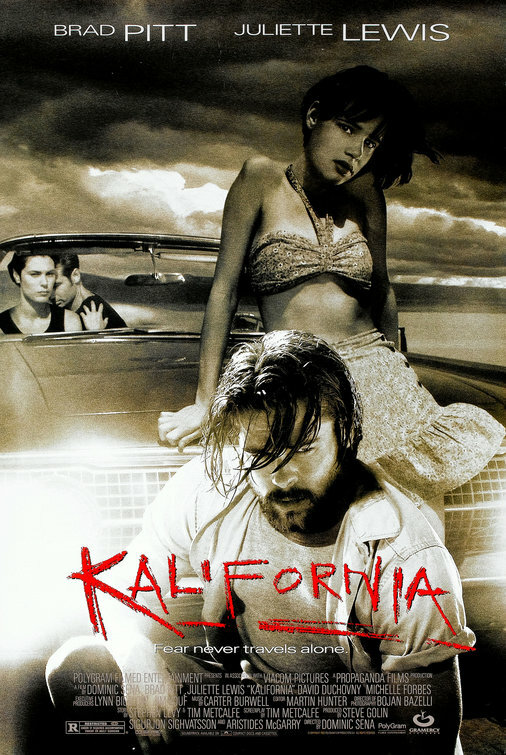 Overall, Kalifornia is an early example of how good an actor Brad Pitt is. He gets to be terrifying, sinister and grotesque, all with his young, rugged good-looks. This is offset slightly by a poor performance from David Duchovny who finds himself swallowed in the scenes he shares with the future mega-star. This is forgotten when the movie reaches it’s third, thrilling act and the blood and body count rises significantly. For me the thing I love is the performance by and dynamics between Juliette Lewis and Brad Pitt. Pitt especially is brilliant! He is SO great at playing scumbag characters, I prefer him in that kind of role than the clean cut ‘World War Z’ kind of roles. Have you see Too Young to Die? It’s just a made for TV movie but Lewis and Pitt both star in the main roles and it has kind of a similar plot. He’s sooo horrible in it haha. I have heard of Too Young to Die but never seen it. I agree, Brad Pitt when he is playing “crazy” is great. Need more performances like that. It isn’t bad and there are worse ways to spend a couple of hours.